The triangle of the Afar people. It takes 8 to10 days to do this tour from Addis Abeba to Harar, taking in Awash National Park. Awash National Park (827 km2) is the oldest and the best preserved park in Ethiopia. Formerly the hunting territory of Emperor Hailé Sleazier, it shelters more than 50 species of mammals (oryx, lesser and greater kudus, bubals, gazelles…). 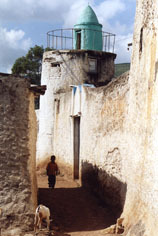 At first, the road from Awash to Harar follows the railway. From Mieso onwards, it climbs the mountain and practically skirts along the ridges, offering splendid panoramas. 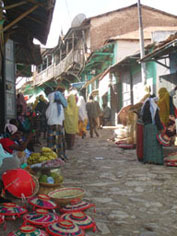 Strolling around Harar, Islam’s fourth holy city, you will discover the Harari houses, their interior courts, their little gardens and the warm welcome of their residents. In a lane, just around the bend, appears Rimbaud's house. A little further on stands a colourful and well stocked market. This city itself justifies a stay of several days ; whatever you decide, it will be an enjoyable, surprising and enriching stop on the way to the Afar area. In this environment, the Afar people try to survive with their camels and their herds, perpetually seeking water, food and pastures. Yet they take great care to adorn themselves with taste. Men wear the "gile", an impressive large curved knife. 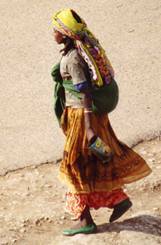 The women wear their hair in intricate forms, plaited and decorated with multicoloured beads. Their clothing is a blaze of bright colours.